Porsche 'is still world's most profitable carmaker' despite parent's huge loss. MUNICH – Porsche AG's parent company said Thursday it lost 4.4 billion euros ($6.6 billion) before tax in the year ending July 31, after earning 8.6 billion euros before tax the year before. Porsche Automobil Holding SE's loss comes after the company failed in its bid to take over the much larger Volkswagen AG. A Porsche SE statement said the main factor in the loss was a write-down on cash settlement options to VW shares. The loss was also influenced by the "hidden reserves and liabilities" identified in the course of the purchase price allocation for the shareholding in VW, the company said. In its attempt to buy a controlling stake in VW, Porsche SE amassed more than 10 billion euros in net debt just when credit markets froze and it needed to refinance, forcing VW to extend it an emergency loan and opening the door for a reverse takeover. The attempt ended with VW agreeing to take over Porsche SE's sports car business, which makes cars such as the 911 and Cayenne. 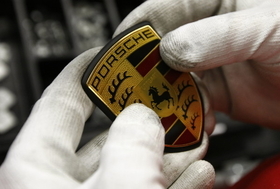 Porsche SE said its auto business operated by Porsche AG still recorded a double-digit operating margin, which means 'Porsche remains world's the most profitable automaker," a statement said. Porsche drastically slashed its dividend, proposing a symbolic dividend of 0.05 euros per preferred share and 0.044 euros on ordinary shares that it will distribute after taking 1 billion euros from earnings retained in the past to post a tiny 8.2 million euro net profit based on German accounting standards. Qatar's sovereign wealth fund freed up much-needed cash for Porsche by agreeing in August to take over a derivatives package at a substantial discount to book value that gives the Gulf state access to nearly a fifth of VW's votes. VW shares slid 5.1 percent on Thursday, falling below the 100 euro mark for the first time since March 2007, as the air came out of the stock that had seen shares rise to 1,000 euros at the end of October 2008. The Porsche and Piech clans that control Porsche SE put aside their differences and sacked CEO Wendelin Wiedeking, Germany's highest paid manager, along with his finance chief Holger Haerter in July after their bold attempt to swallow VW backfired. VW plans to buy a 49.9 per cent stake Porsche's sports car business for 3.9 billion euros by the end of the year, as a first step towards a full merger with Porsche by 2011. On December 3, VW will seek approval from shareholders for a more than 4 billion euros increase of its preference share capital to fund the deal. Porsche SE plans to raise at least 5 billion euros in fresh equity to bolster its shaky finances ahead of a merger with its 51 percent-owned unit Volkswagen, a deal set to be completed in 2011.